‘Kashi’ – the city of effulgence! The heart of every Hindu leaps to divine heights the moment he hears ‘Kashi’. Every Hindu considers dropping his body at Kashi as the highest attainment. Sankaracharya says that Lord Viswanatha transmits the highest knowledge of Brahman to those who live in Kashi. Innumerable sages have lived in this city, which according to modern researchers, is at least 5,000 years old. Sankaracharya started his mission here. Even Buddha gave his first sermon at Kashi. Sri Ramakrishna had the vision of a ‘Swarna nagari’ (golden city) when he beheld Kashi from a distance. Tulsidas wrote Ramacharitamanas here. Kabir lived here. Trailinga Swami, a mighty yogi, lived for almost 280 years in this city. Such is the glory of this city. With Bhagavan Sri Ramana Maharshi’s grace and Sri Nochur Acharya’s blessings, a satsang is being envisioned in this holy city of Kashi. 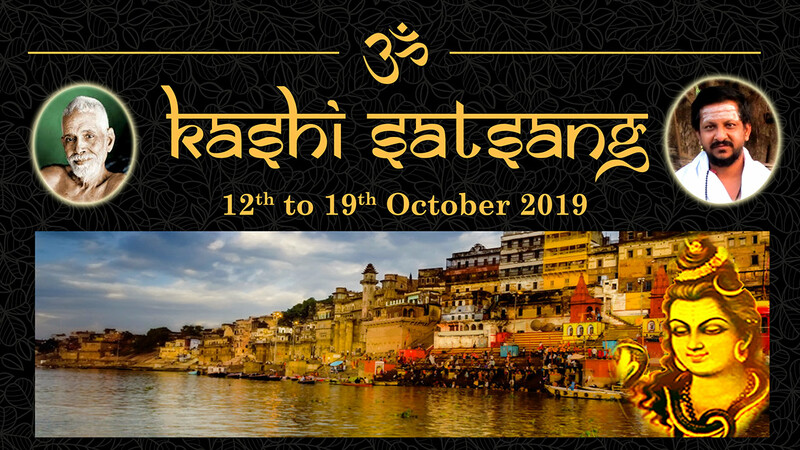 This saptaham (seven-day satsang) is planned by the banks of Ganga Mata in the punya ksethra of Kashi, from October 12-19th 2019, with Sri Nochur Acharya gracing us as the Yajnacharaya. This satsang will be held at Kovilur Mutt grounds opposite Udipi Krishna temple, next to Assi Ghat. Almost all the Ashrams and hotels have lifts and all the rooms have western toilets. Most of the rooms have 2 beds with an option of adding another mattress if there is a third person. We are unable to provide single occupancy rooms, given our constraints. As Kashi is warm at that time of the year, devotees may want to take this into consideration before selecting the type of room. Accommodation has been arranged for 7 days – from 12th Oct 1 PM to 19th Oct 11 AM. If you reach earlier on 12th, hotels/ashrams may give you rooms if they are available. Else, you can keep the luggage in cloak rooms available in hotels/ashrams and return at the designated check-in time. More Information on check-in and check-out times, luggage room facilities etc., for each hotel/ashram will be sent to you after we allocate the rooms. Rooms will be allocated on first-come first-served basis and communicated on October 1st. If you plan to stay in Kashi before 12th Oct or after 19th Oct, please arrange your own accommodation. 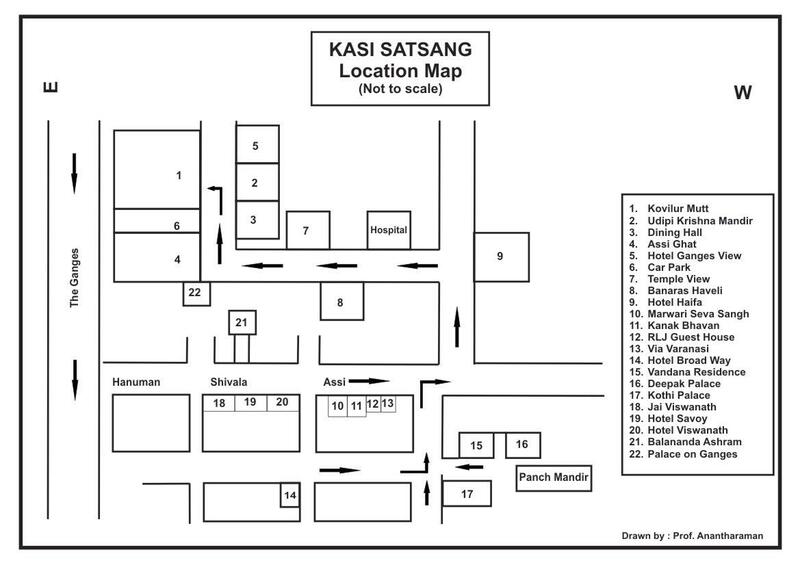 All Ashrams and hotels are within 1-1.25 KM of the Satsang venue. For the convenience of elderly devotees, e-rikshaws have been arranged between selected primary locations near these hotels/ashrams and the satsang venue thrice a day at no extra cost. Wholesome sattvic food will be served 3 times a day besides coffee and tea. Food will be served near Satsang venue from 12th Oct (early lunch) up to breakfast on 19th Oct. Packed food will also be given on 19th after breakfast, for travel purposes. Devotees need to make their own travel arrangements to reach Kashi. Varanasi is well connected by train and air from Chennai, Bangalore and Mumbai. Daily direct flights are available between Varanasi and Bangalore/Chennai/Mumbai. It takes about an hour from the airport to Assi Ghat. Please contact Sri. Nataraja Iyer, Dakshineshwari Travels 94515 26854, 90448 35666 in advance. AC Car – Rs. 800 (Indigo), Rs. 1,250 for Innova, Rs. 2,200 for 17-seater tempo traveler. Those interested in pithrukarya, please contact Sri. Kedar at 0542-227 3637 or 94153 03637. Please plan 4 extra days before or after Yagna for pithrukarya. Registration can be done online here from May 1st 2019 till September 30th (or earlier if the registrations are filled up). Please read all the information given in the Satsang website as well as Frequently Asked Questions before registering. Registration cost covers accommodation, food, local e-rikshaw to/from satsang venue (3 times a day) and other satsang arrangements. It does not cover travel costs from your home town to Kashi and transportation between airport/railway station and your place of stay. How to pay for registration? Bank charges 2.36% for this service, which will have to be borne by the devotee. Registrations costs per person including these bank charges will be Rs. 10,754, Rs. 12,802 or Rs. 15,875 based on room type”. To help us track payments effectively, we will give a unique account number to transfer the amount to. For example, if your mobile number is 9845012345, you will be given an account number ending with 9845012345. You can transfer the amount to this account using online banking facility of your bank or from your bank branch. Devotees registering from outside of India will need to use cards issued in India as we are unable to accept payments from a foreign country. We understand that devotees may need to cancel for many reasons and we want to refund as much as possible but are constrained by the time needed to find another devotee to take your place. On or before August 31, Rs. 1,000 per person will be deducted. On or before September 30th, Rs. 5,000 per person will be refunded. Registration can be done online here from May 1st 2019 till September 30th (or earlier if the registrations are filled up). A google email ID – This is mandatory for registration. Do you accept check or cash for registration? What are the costs? What all does registration cost include? How much refund will i get, if I cancel for any reason? Once I do the registration for a type of room, can I change it later? For example, if I have registered for Ashram Non-AC, can I change it to Ashram AC later? Unlikely as no rooms may be available. Do Ashrams and hotels have lifts, as I cannot climb stairs? Yes, almost all the hotels and ashrams have lifts. Do the rooms have western toilets? How far are the Ashrams/hotels from Satsang venue? Any transportation arrangements made? In general, Kashi has many e-rikshaws and autos. I want to do Pithrukarya? Can you suggest a person in Kashi? Please contact Sri. Kedar at 0542-227 3637 or 94153 03637. Please plan 4 extra days before or after Yagna for pithrukarya. Can you arrange accommodation for me if I come earlier than 12th October or stay after 19th October for Pithrukarya? How will be the temperature in Kashi in October – cold or hot? How can I arrange for car from Railway station/Airport to where I am staying? – AC Car – Rs. 800 (Indigo), Rs. 1,250 for Innova, Rs. 2,200 for 17-seater tempo traveler. Which Ghat in Kashi will the Satsang be held in? Devotees who want to offer Annadanam in this punya kshetra, can contribute Rs. 10,000 or multiples thereof. Devotees who wish to encourage Vedapatashala children from Sri Ramana Maharshi Brahmavidyasrama (run under the spiritual guidance of Sri. Nochur Acharya), can contribute Rs. 8,000 or multiple thereof. This will be used towards transportation, food and accommodation of these children for Kashi satsang. Call Prof Anantharaman at 9840428506 or Sri Nandakumar 9360088935 between 8 AM – 9 PM. If they are not reachable, please send a Whatsapp message and they will respond at the earliest.